The conference is planned for undergraduate, postgraduate and doctoral students under the age of 30. It aims at showing the full scope of current interests of young researchers, as well as the current condition of research on broadly understood Jewish Studies. 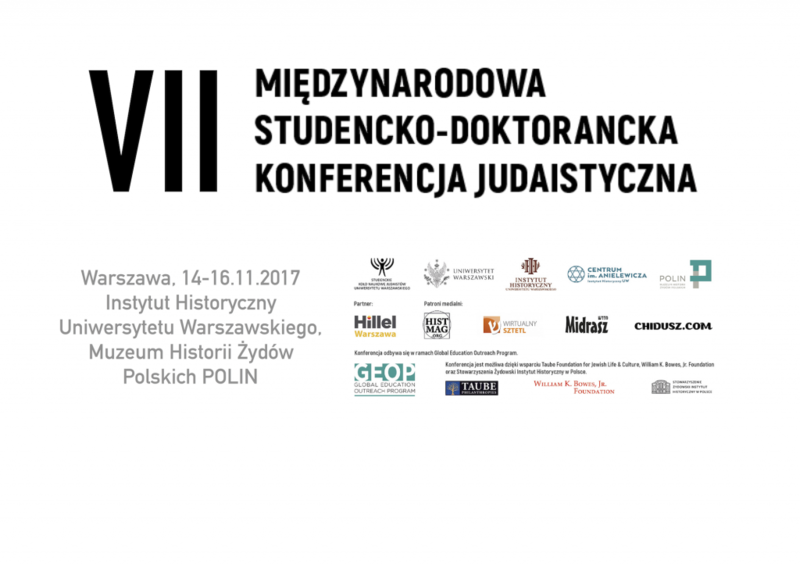 The conference will focus on the global history of Jews and the history of the State of Israel from ancient times until today. The topics cover: history, history of art, philosophy, sociology, cultural, literature and religion studies as well as linguistics (focusing on Hebrew, Yiddish and Ladino). The conference will be accompanied by a program of scientific and cultural events. We are planning to publish a bilingual volume (in Polish and English) in 2018. 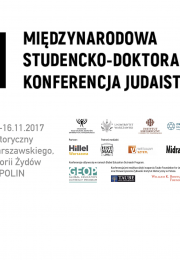 To take part in the conference send us an abstract (200-300 words) with information about your preferred presentation language (Polish or English), your brief biographical note and a completed application form (download: http://bit.ly/2umSDcL) at judaistyka.kn@uw.edu.pl. The deadline for submitting papers is 1st September 2017. Participants will be informed about whether they have been accepted or not at the beginning of September via e-mail. The decision of the Organizing Committee is final. Every participant is required to pay a fee of 50 PLN ($13 or €13). We do not cover the costs of travel and accommodation in Warsaw during the conference, but we can help organize your stay in Warsaw. Academic Committee: dr hab. Anna Michałowska-Mycielska, dr Artur Markowski, dr Monika Polit; Organizing Committee: Joanna Filipska, Matylda Jonas-Kowalik, Zuzanna Łapa, Natasza Majewska, Agata Maliszewska, Pola Namysł, Jowita Pańczyk, Natalia Różańska, Anna Sasińska, Bogumiła Siebyła, Mateusz Szczepaniak, Zofia Zięba, Jakub Zygmunt.